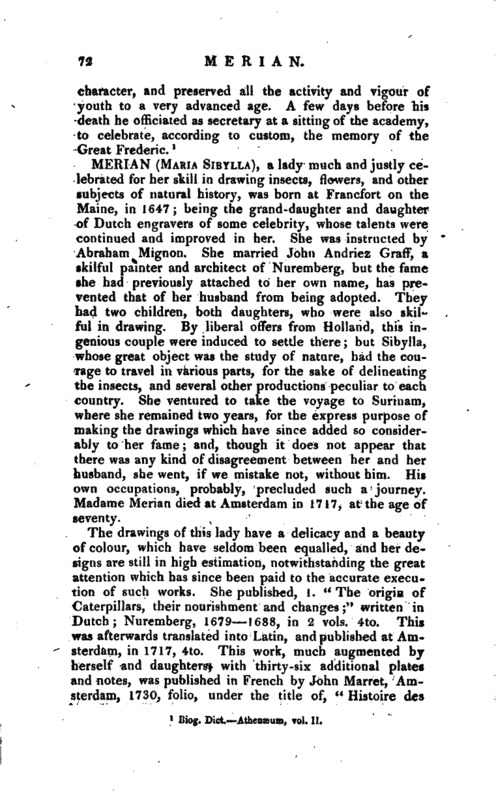 , a lady much and justly ceJebrated for her skill in drawing insects, flowers, and other subjects of natural history, was born at Francfort on the Maine, in 1647; being the grand-daughter and daughter of Dutch engravers of some celebrity, whose talents were continued and improved in her. She was instructed by Abraham Mignon. She married John Andriez Graff, a skilful painter and architect of Nuremberg, but the fame she had previously attached to her own name, has prevented that of her husband from being adopted. They had two children, both daughters, who were also skilful in drawing. By liberal offers from Holland, this ingenious couple were induced to settle there; but Sibylla, whose great object was the study of nature, had the courage to travel in various parts, for the sake of delineating the insects, and several other productions peculiar to each country. 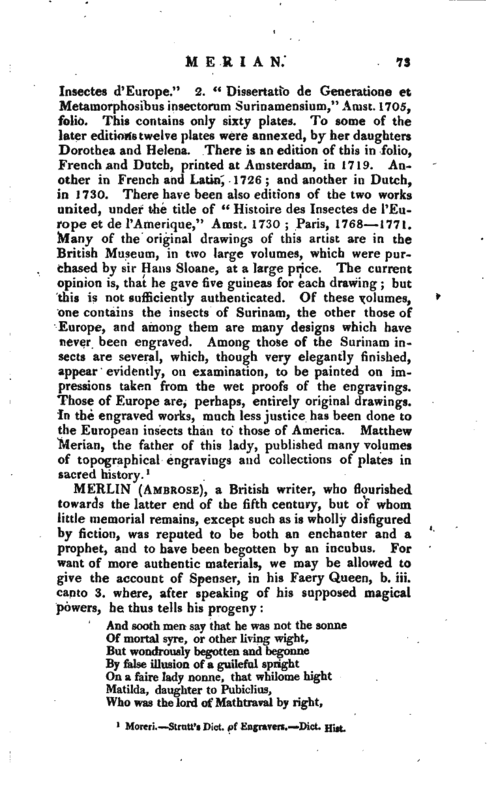 She ventured to take the voyage to Surinam, where she remained two years, for the express purpose of making the drawings which have since added so considerably to her fame; and, though it does not appear that there was any kind of disagreement between her and her husband, she went, if we mistake not, without him. His own occupations, probably, precluded such a journey. Madame Merian died at Amsterdam in 1717, at the age of seventy. Moreri. —Strutt’s Dict. of Engravers, —Dict. Hist.